Welcome to the Spring Edition of Escape. It’s time to dust off those winter cobwebs and embrace the new season with a bang. This issue is filled to the brim with pages on home ideas, fitness tips, lifestyle inspirations, spring fashion and delicious recipes. 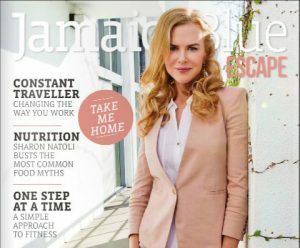 Plus our cover star, Australian actress Nicole Kidman talks about love, career and why she will always call Australia home. Sit back, relax and enjoy . . . and don’t forget to share your Spring Jamaica Blue experience on Facebook and Instagram using @jbescape. You could find yourself in an upcoming edition!